The idea to do this FanEdit came while I was watching a Star Trek episode called “Arena”. In this episode Kirk fires a mortar and it struck me that it would be quite amusing if it was combined with the incredible rolling explosion from Starship Troopers. After much thought I felt a complete Star Trek/Starship Troopers FanEdit would be impossible. Persevering, I went so far as to cut Starship Troopers to just the Bugs Shots and was surprised at how few usable ones there were. The idea would not leave me alone, so I started to cut together some action scenes. They seemed to work, so I constructed a story around them, which I hope is amusing in itself. Also I hope this will be enjoyed for what it is and not taken at all seriously. I have edited with care so as not to reflect negatively upon the Original Classic Star Trek series, Paramount or Paul Verhoeven’s Starship Troopers. Note: I used a few more episodes. Trek-Heads can have some fun spotting the shows. 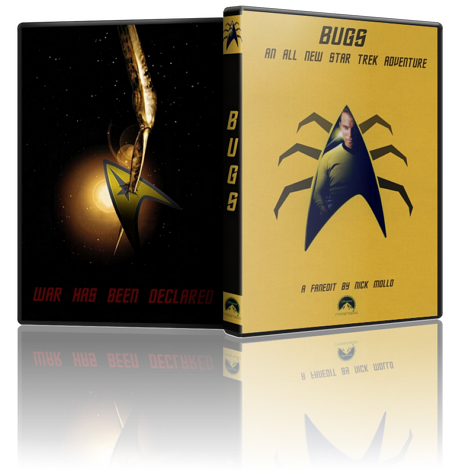 I am a big fan of both the original Star Trek show and the Starship Troopers film, so when i saw there was a fanedit that crossed both over, i was weary of the mashing up of both. It's safe to say that this mix of both was surprisingly good and a refreshing idea. There was a noticeable difference in quality both audio wise and visually between the ST: TOS footage and the Starship Troopers footage, since there was a 30 year difference. The editor also reused some of the footage from Starship Troopers in certain places, but i would expect that from a low budget show like Star Trek, so i was willing to go with it. The only real major problem i had was the Starship Troopers footage seemed to be squished, as if it weren't properly cropped. Maybe some re-editing would help with some of the rough edges. I was also surprised the DVD came with a short film called "Nazi's In Space" with making of/outtakes and a trailer for Time Messerschmitt. The short was a interesting watch and a neat addition. 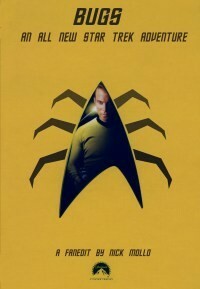 Since both Star Trek: The Original Series and the Starship Troopers trilogy are now on Blu-Ray, i would love the editor to come back or have another editor to redo this fanedit done in the style of the blu-ray releases of the original series, and be able to switch between the original effects and the enhanced effects. It would help smooth out some of my complaints. If i had to recommend this edit, i would. Simply because its an interesting watch. This was fun. It wasn't perfect, it was obviously edited. It was still fun. You should watch it. The narrative is surprisingly coherent, the cuts make sense and work, by and large. Aside from cutting the two sources together, no real video editing was done. This isn't surprising as this edit is 5+ years old. Honestly, great edit. Lots of fun. It is inspiring. It took me far too long to hunt down a copy, but it was worth the effort. This edit has been on my “I really should watch this” list for years now. And now I totally regret that I waited so long. This was so FUN! An absolute joy to watch! I enjoyed every second of it. I can only imagine the hours and hours and hours that went into this finding the footage to craft this all new narrative. This really must have been a work of love and passion. If I was to nitpick (it’s what Trekkers do, eh? ), I thought the closing “planet joke” came off as a little cold, cruel and out of character, but I totally understand why it was done and it works as a good closer. And to chirp in on the original footage vs. remastered debate, if another version were ever made, I think using Remastered Clips would only enhance the viewing experience more. But that’s only my imo. Definitely a good time and I recommend it to anyone who has not seen it and is a Trek fan. I have three minor gripes. Repeated shots, costume/prop discontinuity, edge cropping. And that’s all I’ll say for the negative, because none of that really matters. The edit is just flat-out fun, and you really just have to let go and enjoy it. I knew I would when Mollo used the one of my favorite little moments from TOS…Kirk’s sore back. So what are you waiting for? Download and have a breezy half hour with the Trek episode you never knew existed. Don’t wait as long as I did.